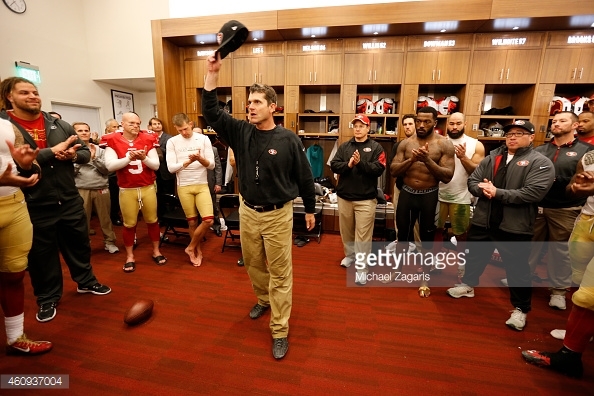 The Downward Spiral That is the San Francisco 49ers | NFL News, as it happens, when it happens. Your one stop shop. Oh how the mighty have fallen. Just a few years ago, the San Francisco 49ers were atop the National Football Conference (NFC), and one of the premier teams in the National Football League (NFL). But one off-season later, they are not the power house they used to be, but a mess. After making the NFC Championship Game for three straight years and having an appearance in Super Bowl XLVII (in which they lost to the Baltimore Ravens 34-31), the 49ers went 8-8. The downhill spiral began at that point. The organization had already had a falling out with head coach Jim Harbaugh, and had fired him, hiring Jim Tomsula to take his place. Not only that, but former offensive coordinator Greg Roman jumped ship to become the offensive coordinator for the Buffalo Bills, and then the team fired defensive coordinator Vic Fangio. However, that was not all. Several key players on the 49ers roster chose to retire, or find greener pastures in free agency. 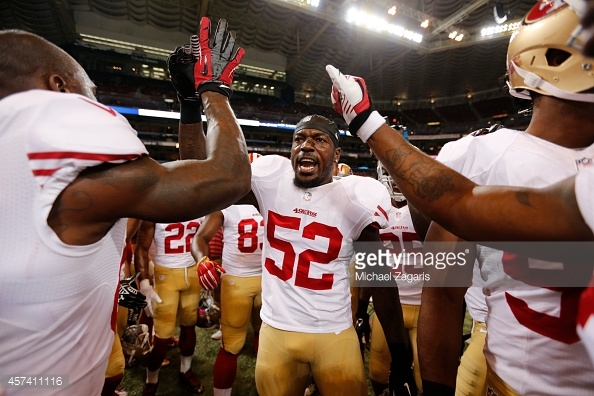 Veteran defensive cogs Patrick Willis (Linebacker), Justin Smith (Defensive End), and key offensive lineman Anthony Davis chose to retire. Even the young, (coming off his rookie year) linebacker Chris Borland decided to retire for health reasons. Then came free agency, where even more talented players like Chris Culliver, Mike Iupati, Michael Crabtree, Frank Gore, and Stevie Johnson left the team. To make matters worse, Aldon Smith, who was to be the defensive anchor after all the changes, got arrested again, and was released from the team. Now what is left is a team in disarray, and in a new era of coaching. All hope is lost, the 49ers are sure to be a bottom feeder team in the NFL, nothing can save them now, right? Not so fast, this team can still play. Even with the amount of blows this team took, they can still be a competitive team. They still have Quarterback Colin Kaepernick, who though had his worst season statistically, has shown growth through a week of training camp. Not only that, but he still has weapons in the form of wide receivers Anquan Boldin and Torrey Smith and tight end Vernon Davis. The offense also has stalwart defenders in the offensive line in the form of Joe Staley and Alex Boone. The 49ers defense is not in shambles, as they still have linebacker NaVorro Bowman, who is coming off injury, and hopefully can stay healthy in the coming season, and he will also have veterans Darnell Dockett and Glenn Dorsey to assist. The defense also has great potential in rookie Arik Armstead from Oregon. Even with the young potential and returning veterans, the San Francisco 49ers are far from being able to compete for the Super Bowl. The 49ers play in the toughest division in all of the NFL, the NFC West, consisting of the Seattle Seahawks, St. Louis Rams, and Arizona Cardinals, who each have been busy in the off-season, improving their teams for a playoff push. The Seahawks are a juggernaut of a team looking to make it back to a third straight Super Bowl, the Cardinals have stability at quarterback with Carson Palmer and can return to the playoffs again, and the Rams have upgraded and are on the rise to the point where they can compete for a playoff spot. That leaves with the 49ers having to fight through a gauntlet just to make the playoffs. Yes, the 49ers will win some key games, but they won’t top 10 wins, they wont have the chance to win that 6th playoff spot. Year one of the Tomsula era will be tough for the 49ers and 49er faithful to swallow because of this downward spiral nightmare.